Today college football has some of the best matchup's we will witness so far in the season. Week 5 truly has it all, top S.E.C powers battling it out in the afternoon and a trip to Death Valley for the game of the night. No. 13 Alabama v No. 8 Georgia: This is the top game of the week pinning two major S.E.C. powers against each other. The major storyline being that Alabama is an underdog for the first time since 2009 against Georgia. This is a position Nick Saban hasn't been in many times before, in fact it's been 72 games and a few national championships since Alabama has been an underdog. You can bet his team will be ready though, especially the defense. The front four for Alabama is going to be the key to this game. Can they stop Nick Chubb and that powerful Georgia running game? The answer is no, and I will explain why. As much as the front four is dominating for Alabama it's the outside corners and linebackers who will be busy trying to slow the run game down. Georgia knows running it straight up the middle will not work so I expect them to try and bounce a lot of runs to the outside, pulling guards to open holes up. Once, they establish this look for a few big play action passes. If Georgia can do that they will win. Alabama needs to stop the run and have their own offense just keep control of the ball and not turnover it over. If you remember there were a total of 5 turnovers in the loss to Ole Miss. That can't happen and Jake Coker knows it. Alabama is not as strong a team as they have been in the past and Georgia needs to take advantage. No. 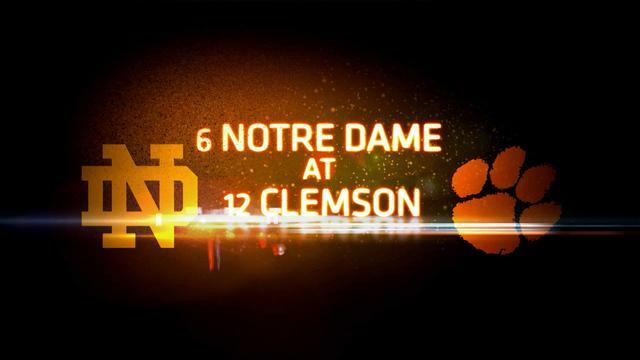 6 Notre Dame v No.12 Clemson: This will be the biggest test the Irish face all year, especially being on the road at one of the most hostile stadiums in college football at Death Valley. Clemson is facing a must win if they want a chance to sniff the college playoffs. Being in the ACC hurts their chances far more than Notre Dame's if they leave tonight with the loss. Adding more intrigue to the game is the fact that Hurricane Joaquin will be bringing his weather along and creating another opponent for both teams to face. This may give the Fighting Irish the advantage in the end. Notre Dame is known for having a powerful O-line and D-line this year and bad weather will only help both of these sides impose their will. C. J. Prosise will see the ball a lot in a wet weather game and the O-line will be able to create plenty of space in the sloppy conditions. The D-line and linebacker core for N.D. will most likely be able to shut down the run game and force Clemson's Deshaun Watson to make plays with his feet and arm. If they can do that and force a turnover or two, the Irish should be sitting pretty in the top 4 of the next football rankings. Clemson's only real chance is when Freshmen QB DeShone Kizer drops back for a pass, he needs to be hit or forced to try and make a play. The Tigers only have four returning starters from a stellar defense last year and this will be one the toughest opponent they have faced so far. The Irish have talent at every position with the likes of Will Fuller, C. J. Prosise and Corey Robinson. If they can get to Kizer though and rattle him that could provide just enough, especially at home to push them to over the line for a W.
That's just my stance. Let me knows yours in the comments below. Above all else enjoy what will be a great day of college football.